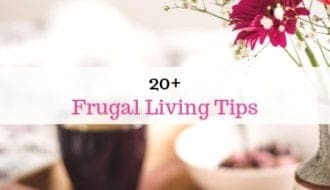 Some of the items in this guide were gifted for review, however all opinions expressed are our own. With Christmas now just one month away, Christmas shopping is probably on your mind! 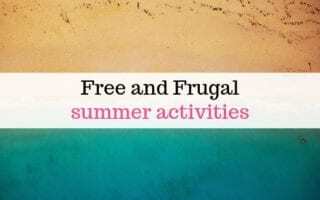 This gift guide is for affordable Christmas gifts for 0-5’s and is full of things we think would make great presents for children this year. Since we’re all about money saving, these are all gifts we think are great value for money. 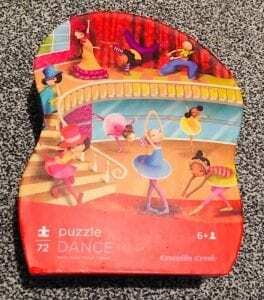 For babies just starting to play with puzzles, this set of baby puzzles from Galt comes in a nice carry box and contains 6 chunky puzzles, perfect for little hands. You can buy it from Amazon at the moment for under £10, so it’s a good choice for a present that doesn’t cost the earth but looks lovely. 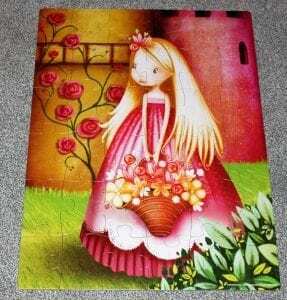 There are quite a few different themes of puzzle to choose from too. Let’s face it, sleep is one of the most coveted things by parents universally, and anything that might help us get more we’ll give a go! This lovely set makes a great gift for a newborn baby or for expectant parents and includes everything you need for a relaxing bedtime routine with your baby. JOHNSON’S® Bedtime Baby Oil 300ml, JOHNSON’S® Bedtime Baby Lotion 300ml, JOHNSON’S® Bedtime Baby Bath 300ml, JOHNSON’S® Bedtime Baby Wash 400ml a baby book and a pair of baby socks. The baby wash gives that lovely ‘clean baby’ smell and the lotion is great for giving baby massage a go. The socks and little book add that nice little touch to make it a cute as well as practical, gift. You can find your giftset here. 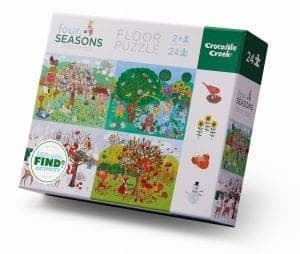 These Crocodile Creek puzzles come in all sorts of designs, and we were lucky enough to be sent a couple to review. 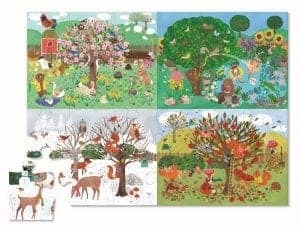 They are beautifully made with really vibrant pictures and both my 3 and 5 year old girls enjoyed playing with them. The bigger puzzle was great for building on the floor and looked fab when it was completed. 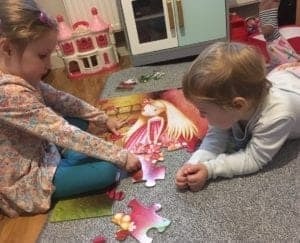 The smaller puzzles say from age 6, but my (just turned) 5 year old was quite happy playing with this one, so if your younger child enjoys something a bit more challenging I wouldn’t let the suggested age put you off. The shaped boxes are beautiful too, and they make a lovely present. You can buy them in all sorts of designs so there’s lots to choose from. Books always make a fab children’s gift. 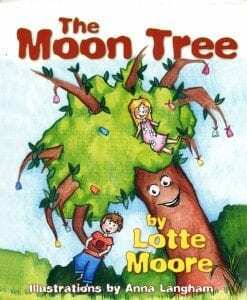 This range of books is from 82 year old children’s author Lotte Moore, and consists of fun and colourful stories for younger school age children. 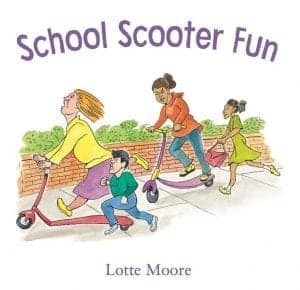 We were gifted a copy of School Scooter Fun, a story where the grown ups are children for the day! My five year old has loved reading it together with her Nana. You can buy a copy here. 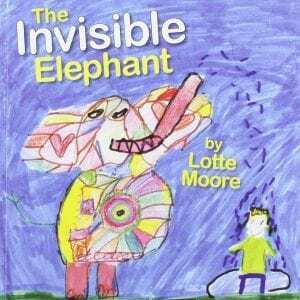 Lotte started writing aged 70 years old, has currently written more than 25 books and is now a best-selling author! My daughter was gifted a Baby Playtime Bus for Christmas when she was 2. Both her and her younger sister have enjoyed playing with it, and it’s still great for them both even as they get a little older. It’s bright and colourful, and good to play with just as a bus even without the puzzles. The sounds are not overly annoying (as some electronic toys can be!) and the batteries last a decent amount of time. It has a feature which means it turns itself off after 20 mins not being used and wakes back up if a button is pressed again to conserve battery life. These water magic colouring books are a great and reasonably cheap gift idea. 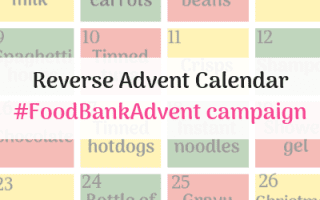 You can buy them in all sorts of varieties – dinosaurs, pets, faeries, safari etc, so there’s bound to be a version with something for every child. You just fill up the pen with water and then watch the colours ‘magically’ appear as you colour in. A great alternative for painting if you want to avoid the mess! As it dries the colours disappear so it can be coloured multiple times. This is a toy that never goes out of fashion, and is fun for adults as well as children! 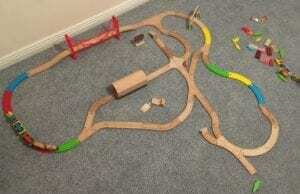 The most well known brand version for wooden train tracks is Brio, but it can be quite pricey. However you can buy the equivalent from Tesco and Ikea among others, and the pieces all fit together. There are packs of tracks and trains to suit most budgets, and it’s a gift that can be built upon on other occasions to add more pieces, such as junctions, tunnels etc, or just to expand the track. Our wooden toy kitchen is a firm favourite! 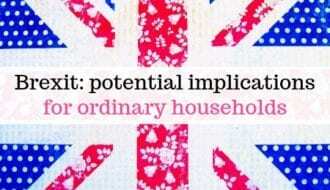 My daughters love to use it to cook, make tea, put things in and take them out etc. Pretend play is really important for helping cognitive development. Children love to model adult behaviour but sometimes it’s not possible or safe to let them actually get involved – boiling vegetables on the hob is obviously not a toddler friendly activity! 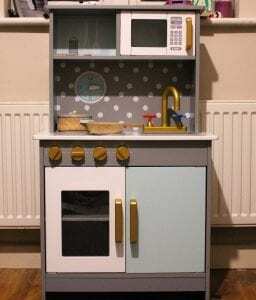 Toy kitchens let them mimic and role play everyday activities in a safe way. It’s great for letting them be creative and use their imagination. The only downside of these is that they do take up quite a lot of space, but they look a lot nicer than a lot of plastic toys and can provide hours of entertainment. It’s a great toy for interacting together as well, as they love you to get involved, make you pretend food etc. If you’re wanting to buy a toy kitchen for a reasonable price we’d really recommend the Asda one. It costs around £40, which is a pretty reasonable price for a wooden kitchen compared to other brands and it’s pretty sturdy and looks nice. Just be aware you have to assemble it yourself!